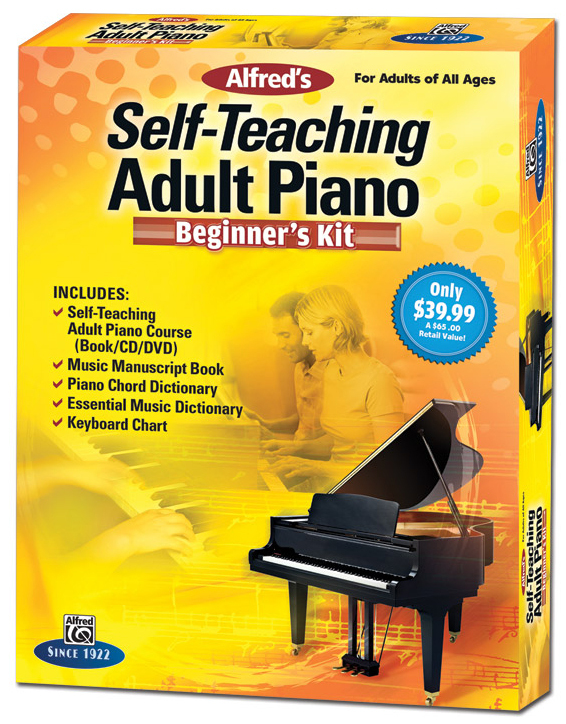 * Continuing the incredible popularity of Alfred's Basic Adult Piano Course, the new Self-Teaching Adult Piano Course book adapts the same friendly and informative style for adults who wish to teach themselves. * Included is a CD containing all 65 musical examples. * The accompanying DVD includes an introduction to all the pages in the book and performances of the pieces by well-known teacher, Gayle Kowalchyk. * The Music Manuscript Book contains 64 blank, 12-stave manuscript sheets. * Pages are 9" x 12" and printed on 100% recycled paper. 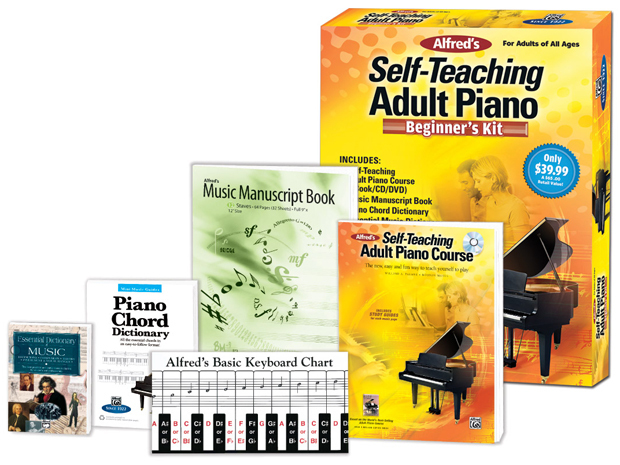 * Alfred's Mini Music Guide: Piano Chord Dictionary provides essential information in a convenient size. 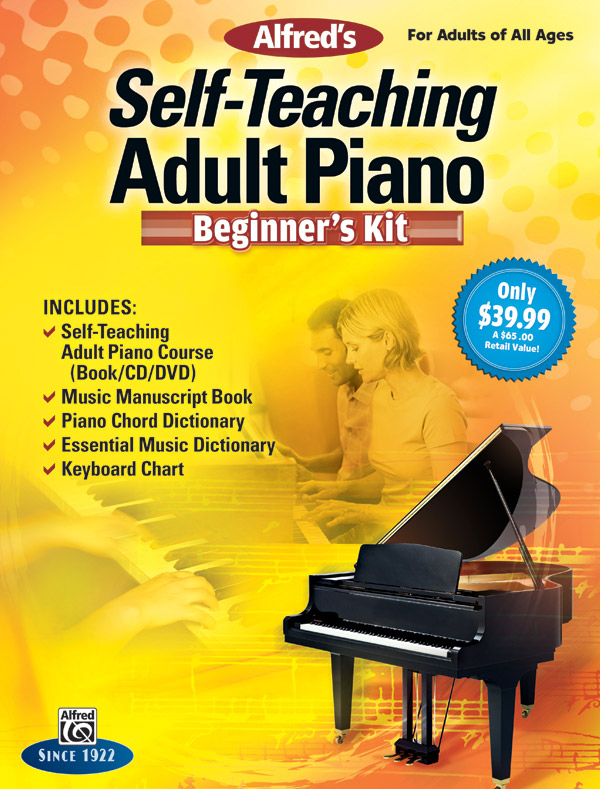 * With 600 unique chords and voicings for all 12 keys, clear diagrams, fingerings, note names, and a music theory review on chord construction, inversions, and advanced voicings, this is the most useful compact piano chord dictionary available. * The pocket-sized Essential Music Dictionary reference book covers every major aspect of music, from basic principles of theory and concise biographies of composers to pronunciations of foreign terms and ranges of instruments and voices. * The two-sided fold-out keyboard chart shows the entire keyboard of the piano with each piano key named and its corresponding note on the grand staff for five octaves. * Side One may be placed on the piano above the keys and Side Two may be used away from the piano for additional review.